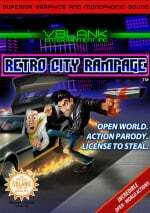 Once upon a time, Retro City Rampage was announced for WiiWare. That time was over two years go, and with the game having missed its most recent May release window many are starting to worry that this quirky 8-bit-styled title won't make it to WiiWare. The good news is that the game's still coming to WiiWare, and should be out this summer. A press release from D3Publisher this week pokes fun at the game's seemingly interminable development time, but that should come to an end before the leaves turn brown and our hair goes completely white. 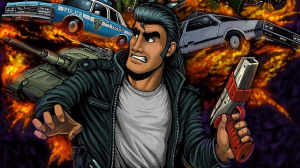 Check out our Retro City Rampage interview for more. Retro City Rampage is finally right around the corner after its legendary (and lengthy) development. The wait was worth it, and it’s playable early at E3 to prove it. Head over to D3Publisher’s booth (South Hall #501) to play it on the Xbox 360® video game and entertainment system from Microsoft. Developer Brian Provinciano will be at the show for all of your interview needs, alongside composers Leonard Paul (Freaky DNA) and Matt Creamer (Norrin Radd) to give you an inside scoop on the game’s IGF nominated soundtrack. This 8-bit game’s virtual cartridge tips the scales at 128Mbits with so much content that it nearly needed the strength of two Power Gloves to jam it into the console. It boasts a massive story mode with over 50 missions, an arcade mode with over 40 leaderboard challenges for instant pick-up-and-play action, a free-roaming mode with cameos and crossovers, and bonus games including an 8-Bit Splosion Man, BIT.TRIP: Retro City, and “Virtual Meat Boy” (put on your red and blue 3D glasses, now). It’s also packed with 50 vehicles, over 25 weapons and power-ups and over 200 styles to customize your character with. If you think you’re rad enough to outrun the law and carjack the '80s, then lock and load your LIGHTGUN and power up your POWER-UPS, because you're ready to go on a RETRO CITY RAMPAGE! I'll get this on XBOX 360 rather than the Wii. I just hope they don't make it an Xbox/Playstation exclusive... With wiiware I worry. I like all the references in the trailer but open world games like this just aren't my sort of game. Sure is taking its sweet time, been waiting for it forever. Thanks James! This is very reassuring to know it's still coming to WiiWare (I was really hoping it would meet it's May release date but so be it). I've preordered it for PC - hopefully it comes out soon. It'll be one of the things my laptop can actually run! (I'm waiting to build a new gaming PC). It's still coming to XBLA, first, I'll bet. I think the bonus cameo games ('Splosion, BIT.TRIP, Meat Boy) excite me more than the proper game. Hope it actually comes out. But the WiiWare size limitation shouldn't at all be a problem, given its purposeful scaled back visuals, etc. alright!!!! this is good news, cant wait to download it! I'll get this on Wii rather than the XBOX 360. And by "Summer 2012" they mean THE VERY LAST DAY of Summer, and that's only a 15% chance. I think I'll get it on PSN. Hopefully it comes out on the eShop at some point, the 3DS is really what I would like to play it on. "Retro City Rampage Is Still Heading to WiiWare"
Great to hear. I have some points cards saved up for this. Instant download on WiiWare for me. I'm surprised that they are still bringing it to WiiWare. Well, that's good news for Wii owners. I'm getting this on my PS Vita. Of course it's coming to WiiWare, it can easily fit on to the service so why shouldn't it? I've been pumped for this game since it was 1st announced, it's gonna be hilariously fun Can't wait! @Mickeymac, that's not really a remarkable prediction my friend, because almost everything arrives on the X-box 360 first. I'll still be downloading this on the Wii for sure, because I don't own a PS3, X-box 360 or a PC of my own. Plus, WiiWare definitely needs the support more than any other service. Now we just need a definite confirmation for La-Mulana. meh, lost interest in this on wiiware. im buying on psn. Honestly I would prefer if it just came out on 3DS instead! While I did get a Wii Shop game recently, my 3DS is home to my Nintendo fix nowadays (at least until Wii U). Yes I know I will be able to transfer the game to Wii U! Last i heard the game was singing this song. Wow i had completely forgotten about this. Glad to see it's still coming,i'll be buying it on day 1. (I just hope the WiiWare version doesn't suffer much).